If you haven’t already seen it, a reminder that you can download a complete copy of the Preliminary Land Development Plan here. Here are some diagrams (bigger versions if you click on them) that may be useful to you in understanding what the developer is proposing to do. They have already demolished one of the Penn Plaza buildings. You can see how huge the site is if you walk by. This is the “Phase One” site. 50,000 square feet for a new Whole Foods (roughly double the existing store). About 12,000 square feet of office space above. 582 parking spaces in a 3 story parking a garage, accessed from South Euclid (Penn Circle West) and a new street that cuts across the park from South Negley. This street is currently unnamed, but sometimes referred to as “Eva Street” in the developer’s documents, but it is NOT the existing Eva Street. 200 units of “market-rate” apartments. None of these units will be affordable housing. The new building is essentially the ENTIRE site that you can see cleared right now. There are no setbacks planned, except for immediately adjacent to the townhouses on S. Euclid and Topaz Way. This will also be a “mixed-use” building program, meaning some mix of commercial, retail, and residential uses. There will be another significant parking garage attached to it. We have heard up to another 600 parking spaces. There will not be any affordable housing in this phase either. 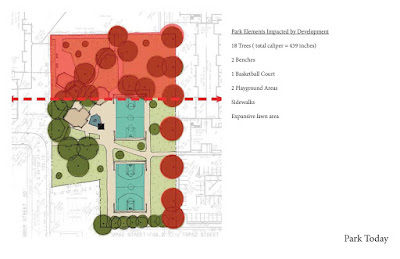 diagram showing park as it exists today: everything in red will be demolished for development. 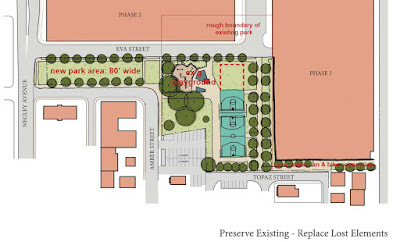 They are reconfiguring the park in order to use the northern-most third of the park for their development, to provide car access to Whole Foods. 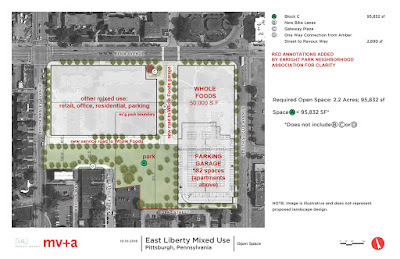 They are destroying 17 of the trees, including at least 14 that were planted in the 1964 park design, when the park was formed to address the “urban blight” of East Liberty. Most of these trees are very tall and healthy pin oaks, which contribute significant environmental benefit to a neighborhood that is sorely lacking in green space. You can read moreabout the benefit of these trees in the report that Tree Pittsburgh did a few years ago when they were helping the City of Pittsburgh identify the places and resources that needed investment in their park system. 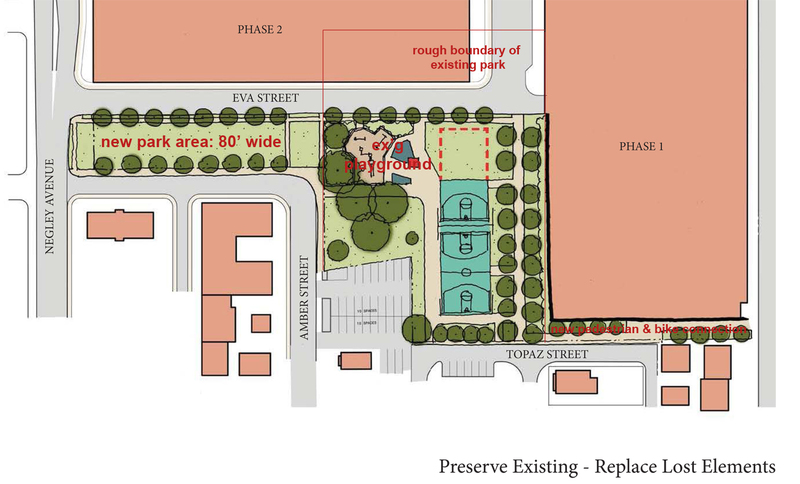 The reconfigured park will be very different in shape – a long and skinny leg out to Negley Avenue will need to also address a hill. There is not yet (as of this writing) a financial commitment from either the developer or the City to pay for a redesign and rebuilding of the park. We are still trying to find a way to get affordable housing back into this site. We, the neighbors, have proposed different approaches and we hope that our partners at the City and East Liberty Development, Inc., will find a way to make something work. It will never replace all of the units lost, but if we can find a way to make sure that there are safe, affordable, accessible, and convenient apartments for some of our neighbors who desperately need and want to be part of this community, we will do everything that it takes. There has been a small working group of residents who have been meeting regularly with the developer since the end of August, trying to negotiate a solution. We have put several proposals before them and have been rejected. We are still waiting to hear on our most recent one. There have NOT been any open public meetings on this project since the City Council hearing in April, and before that there were two meetings to discuss the park only. Monday, December 12 from 6-8 pm will be the first time that the developer or the City have come out to talk to a broad cross-section of the neighborhood about the concerns for the development overall. This meeting will be held at East Liberty Presbyterian Church, 116 South Highland Avenue. It sounds like all we talk about is the park, but the reality is that the park is only our point of entry into the conversation. We, the near neighbors, have been shut out of the discussion of whether there can or should be affordable housing on this site, which we believe is critical to a healthy East Liberty for all. The developer has refused to discuss this with us. And we clearly have little leverage to make it happen. What we do have is a critical PUBLIC resource (the park), that the developer wants to use to enhance their development project, but on their own terms. We have been trying to leverage this resource to make some degree of change to the proposed development. And, finally, a few words about Whole Foods. We've heard a lot of murmurings about whether Whole Foods has a responsibility to the community. And a lot of, frankly, glee from people who want a better parking scenario, and who like to say "well it's not like Whole Foods evicted everyone..." and "...well at least it's not Walmart, now THAT would be horrible..." So here are a few facts for you to consider. The architects on this project, MV+A Architects out of Washington DC, have designed upwards of 100 Whole Foods across the country, including the recent Wexford and South Hills stores. MV+A Architects have been working on this project for over two years now (fall of 2014), according to the comments made at Planning Commission both last week and last October. The Penn Plaza tenants received their initial eviction notices in June 2015. Whole Foods announced that they would be the anchor tenant in August 2016 after a year of the developer dancing around the question. Which means that MV+A Architects and Whole Foods started working on this project nearly 9 months before residents were evicted. Which means that they knew full well what they were signing on for. Up until winter of 2015/2016, Whole Foods was an active and engaged partner on the Enright Park Community Garden, having founded it with our neighborhood group and the Kentucky Avenue School 8 or so years ago. They provided both financial and staff support for the garden, and were active in talking about how they wanted Whole Foods to be part of the community. This past summer, we were notified that they would no longer be involved in the operation of the garden. Many of the Penn Plaza residents and other East Liberty community members are, in fact, regular customers at Whole Foods. For all its reputation as "Whole Paycheck", it is, actually, possible to shop there (if you avoid the fancy cheese) and come out with a grocery bill that is the same or less than at Giant Eagle, and be buying organics or gluten-free options or other foods that are specific to dietary wants or needs. We are all entitled to make choices about the kinds of food that we eat. And, finally, up until a few years ago, Whole Foods used to like to tout the fact that the East Liberty store had one of the highest uses of food stamps/EBT cards in the entire chain, across the country. If I remember correctly, it was along the lines of 10% of their total sales that were paid in EBT benefits. They felt that this indicated that they were contributing to the community in a positive way, and that it showed that they were not purely a gentrifying force. So you be the judge of where you want your dollars to go. subject line: Planning Commission Pennley Place South hearing. Be sure to send them by 12 noon the day of the hearing, and earlier if possible. Open with a short statement of why you are writing. E.g. “I am writing in opposition to the Preliminary Land Development Plan” or “I am writing in support of the PLDP” or “I am writing to ask you to consider specific issues in your review of the PLDP”. If you are speaking, you will have three minutes. Try to make a clear argument, rooted in fact, about why you are making the case that you are making. Be honest, and don’t be accusatory if you disagree with someone. Be passionate. They can vote to APPROVE the PLDP. They can vote to REJECT the PLDP. They can move to TABLE the decision, pending further information or additional community process. Your statement or e-mail can provide support for any one of these actions. Frankly, it is highly doubtful that they will reject it outright. If there is a lot of opposition to the plan, a more likely scenario would be to table the decision and direct the developer to work with the City and community to address the major concerns. Or to approve it with conditions if it seems that the concerns can be addressed in this manner. Further, as a community, we remain deeply committed to a vision for this site that brings with it affordable housing, not simply in the form of funds to be distributed elsewhere, but a commitment to a vision for East Liberty that provides equitable access to housing that is located near resources and opportunity. Concentrations of wealth can be just as detrimental to the community fabric as concentrations of poverty. The value of the Penn Plaza site to the community is that it has the potential to provide access to resources, including transit, groceries, and social amenities, to our community members who are most in need of connection and stability. Affordable housing on this site would be a significant benefit to many of our community members, including seniors and those living with disabilities. We continue to advocate for a portion of the new housing to be allocated for affordable units. Thank you for being part of this and being part of East Liberty's future. That's a good timeline of events, showing that Whole Foods was in on the evictions. Thanks. parks are very important for human beings. correct architecture design is very important because it makes any plaza, house, parks, buildings, schools and colleges unique among all.If we talk about fashion leather jacket fashion it is very inn now a days.